When we started the week, a giant Belephant and Tigray were hard to imagine, but after a week of imagination, a lot of ingenuity, and a ton of hard work, we could proudly say we had built the biggest Belephant and Tigray the world has ever seen! So many more pictures from the week can be found here. The Tigray had a head large enough to sit in, and an articulated jaw designed by these two tinkerers. What sound does a Tigray make in the wild? It's hard to describe but our intrepid tinkerers have developed a system of PVC pipes that approximates it quite nicely. And now that the head is attached to the body, defining features such as ears are starting to appear. How large are Belephant wings? Larger than you might expect. And how will the Belephant move? Answering that required tilting the animal on its side and propping it up to add wheels. It was a team effort for sure. After our mechanical engineering workshops earlier in the week, answers to previously daunting questions came within reach... Q: "How can we make this wobbly head stronger?" A: "Triangles!" Q: "How should we raise and lower these wings?" A: "Pulleys!" "Levers!" And we're making mistakes and learning from them, as we always do. I myself showed students how to attach hinges for a wing and after they had connected it with four screws, I realized I had placed it on the wrong side of the 2x3. Modeling a positive spirit and being humble is something we collaborators do all the time. Today's demonstration at open circle was about how to keep a drill bit straight to avoid breaking it. We've lost a few to pressure applied at an angle. We also train on new tools as tinkerers need them. Today's additions to our toolbox were a jigsaw (for some; quite a few tinkerers had already used it earlier in the week), a hacksaw, and a heated rope cutter. See even more photos from today and the rest of the week on our Flickr page. We learned today that wild animals quickly grow in height. What started out as rectangles on the ground are now five and six feet tall. We found ourselves needing clamps, assembly squares, and friends to hold the wood as we drilled pilot holes and drove screws to connect various Tigray and Belephant body parts. After lunch, we each wrote and then shared answers to the questions "What is Tinkering?" and "Why do we Tinker?" Having fun was a common theme, as was exploring and experimenting with tools and materials. Day two is typically a day that we start to find our rhythm, with small groups of students working together to build parts of a larger structure and new friendships developing. Click to see more photos from today and the rest of the week on our Flickr page. The Belephant has a hexagon frame. The Tigray body with initial cross-bracing. One person holds the wood steady while the other drives the screw, then they switch. Making sure the wood joints are held together tightly. What has four legs, two wings, stripes and a barbed tail? If you guessed a "Tigray" you were correct! This week, we're building Wild Animals and by wild we mean mashups. 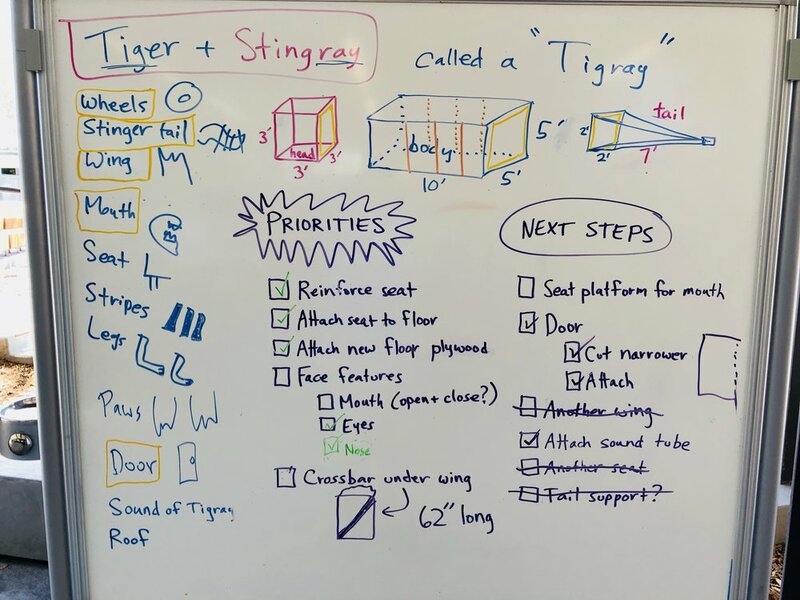 In addition to the Tigray (Tiger+Stingray), we're building an Elephant+Bee (still to be named). Imagine a trunk, six legs, large ears and a stinger. I can't wait to see how these creatures shape up! Day one of Tinkering School is largely devoted to making group agreements related to camp safety and teamwork (e.g. always walk, treat others as they want to be treated) as well as going through tool training. Every tinkerer learns how to use our three main tools: a chop saw, cordless drills, and clamps. We met in two groups to sketch ideas for our animals and to begin to write out a plan for building them bigger than ourselves. Our goals for the week include collaborating and making friends, trying harder than usual, building something bigger than ourselves, and making mistakes and learning from them. To see more photos from today, check out our Flickr page. We learned that drills are two-handed tools for putting holes in wood, driving screws, and removing screws. The chop saw is a popular first day tool because of the many short and long pieces of 2x3 we need for our builds. Checking off one of our "cut list" pieces and moving on to the next task. Student-led design shows off creativity and gives an opportunity for taking pride in our work. During clamp training, students were challenged to build a bridge to span a distance. Teamwork was essential with one person holding the wood and one person operating the clamp. We will come back to these throughout the week, telling stories of how we met them. Signed by all tinkerers and collaborators, this serves as the foundation for how we treat each other and work together. Click through the slideshow below for a few more photos from today.